We recently were asked a great question concerning the death of Jesus and what happened to him after his death. 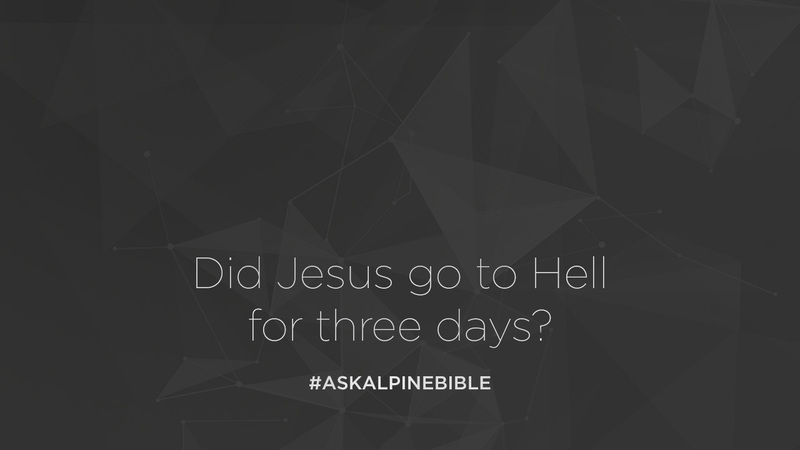 Did he go to hell for three days? Where was Jesus? I think the quick answer for that is: no. Jesus did not go hell. When Jesus was hanging on the cross, in John 19:30, he said, “It is finished.” That statement literally means, “paid in full.” Jesus is referring to the payment he made for our sin. Which would say to us that no further payment is needed, Jesus did not need to go to hell to pay for our sin. When you read in Luke 16, you see a story of Lazarus and the rich man. It gives us a story about Sheol, which is the Old Testament word for Hades, which means a place for the dead. In Abraham’s bosom, there is described two places. The rich man is on one side, Lazarus is on the other. Lazarus is on the side of Abraham’s bosom for those who’d put their faith in the future Messiah. The rich man was on the side of outer darkness. The Bible does tell us in Ephesians 4 and 1 Peter 3, that Jesus, after his crucifixion, went down into the place of the dead and let captives free and proclaimed to the spirits. I think Jesus’ proclamation was one of his victory over sin, Satan and death. He is declaring he is Lord of lords having overcome all of those things and made the payment for sin. The Bible calls Jesus the first fruits, meaning, Jesus was the first to be resurrected and he let the captives free into eternity in his presence and to experience him forever more. The misconception of hell, I think, derives from Psalm 16:10-11. The King James translates the word for Sheol as hell in that passage. I don’t think that’s a good translation. I think it’s the place for the dead, which it is referring to in Psalm 16. Jesus, when he is crucified, it’s a prophetic statement, that he would not see decay of his body, nor be left in the place of the dead. It’s giving a prophetic statement of what would happen to Christ. I think hell comes in Revelation 20:11-15, it’s the lake of fire, the place of outer darkness, the place into which Jesus will ultimately judge and and cast people. Sometimes that definition of hell causes that sort of confusion, but I don’t believe Christ went to hell. I think Jesus went and set the captives free and pronounced his declaration in Abraham’s bosom of him triumphing over sin, Satan and death.